The Cambridge Symphony Orchestra returned to the Somerville Armory on Sunday afternoon for “Leaving Home: Music of World War II”. The community ensemble tackled an ambitious themed program that included both familiar and rarely heard works. The title of the concert suggests the sort of WW2-era music with which we are most familiar: soulful tunes like Bing Crosby’s “I’ll Be Home for Christmas” (1943) and the hyper-patriotic songs lampooned in the 2011 superhero film Captain America. This line of thinking is entirely misleading: “leaving home” refers not to Americans heading off for military service, but mostly to Czech Jews being deported to imprisonment and death. The central scheme seemed to be to recall the musical environment of the Terezín (Theresienstadt) concentration camp. Fortunately, the music was nothing like the depressing atmosphere this might suggest. Conductor Cynthia Woods began the program with the overture to Der zerbrochene Krug (“The Broken Jug”), a 1942 comic opera by Viktor Ullmann based on Heinrich von Kleist’s comedy in which the title euphemistically refers to troubles with a maiden’s honor. This lively piece is not altogether different from Broadway and film overtures of its time, perhaps because the opera was derived from an upbeat early-Romantic German play. It sounds nothing like Ullmann’s other operas or the so-called katzenmusik (“cat music”) written by him and other composers in Terezín. Woods led the orchestra with broad and sweeping horizontal strokes as they traversed numerous short musical episodes. It was not a bad opening. Next, the dense and whirling textures of Pavel Haas’s Study for Strings (1943) recalled industrial machinery at work. This was an ambitious piece for the orchestra; although the strings attacked it with gusto, the connection between baton and sound was not always apparent. The fugal passages did stand out strongly, however, and the ensemble stayed together through the piece’s frequent musical fragmentations and sudden shifts in tone and content. The power of familiarity was demonstrated in force with the work that closed the first half of the concert: Antonin Dvořák’s Violin Concerto in A minor (1879). From the first downbeat to the last, the orchestra played more crisply, more together, and with greater musicality than in any of the other pieces. Some of this was due to the composer, some due to the soloist, and some doubtlessly to a firmer understanding of what the music should sound like. The concerto was easily the best-performed and most powerful work on the program. Ullmann and Haas were both in their mid-forties when they penned their contributions; Dvořák was thirty-seven, but his craft was already much more refined—especially in terms of idiomatic writing and registrational issues. His compositional aesthetic makes more use of longer phrases, contours, and arcs, generating a sense of build and progression that is often less obvious in the works of later composers. These were all facets that the orchestra seized upon: if Woods’s cues were just as clear, they found more resonance this time around, and soloist Irina Muresanu provided an excellent magnet for the orchestra to latch on to. The classic adage “Art imitates life” was frequently illustrated as timbral shifts in Muresanu’s playing were answered by shifts in the orchestra’s color. For all these reasons, this piece hit the CSO’s sweet spot. The main hall of the Somerville Armory features no permanent stage; aside from risers for the brass, the orchestra was seated on the parquet floor along with the audience. 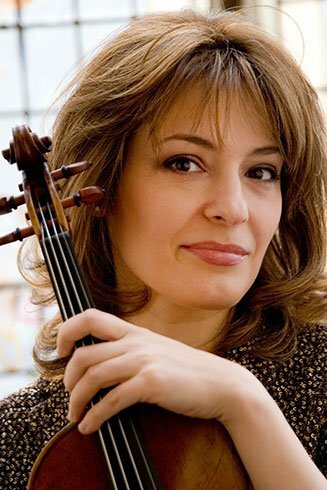 This put Irina Muresanu and her violin mere feet from the first row of spectators; much of the audience sat raptly and hung on her varied and lyrical playing throughout, breathing only (it seemed) when she did. Woods set an opening tempo that was brisk but not too fast, and led the orchestra in a lively but supporting role. The acoustic was slightly dry, making each of Muresanu’s strokes stand out with crisp clarity; this made the precision and skill at work that much more appreciable. Her playing style was forward without wandering into aggression. The second movement of the concerto creeps up on the listener, and Woods led the orchestra into the Adagio ma non troppo without pause. The wind section excelled here, especially the first flute (unfortunately, the assignments for each piece were not indicated in the program). The horns, prominently placed on their riser, also made the most of their featured moment. If there were a few passages that were not entirely in tune, the times in which this stuck out were relatively scarce. In the fast-paced finale that is the third movement, the difficulty of the rapid pizzicatti could be seen on many of the string players’ faces, but their playing held together. The applause at the end was strong, loud, and fervent. Following intermission, the orchestra returned for David Post’s Fantasia on a Virtual Chorale for String Orchestra (2003/2011). This piece (originally a commission for the Hawthorne String Quartet) was noted in the program as having “thematic and harmonic fragments that swirl and grow”. This is not an inapt description: there are certainly many fragments strung together in it. To the listener, these come across like pieces of a jigsaw puzzle, with the final image of the titular chorale clearly seen/heard only at the very end. Unlike a classical theme & variations or the theme & development of sonata form, however, there was not a strong sense of arrival at the end. Whether this was due to the score or the interpretation was impossible to tell. The final offering, Béla Bartók’s Concerto for Orchestra (1943), was the only WW II-era work on the program to be written in the United States. (Bartók immigrated from Hungary in 1940 and wrote the piece to a BSO commission.) A series of movements showcasing the different sections of the orchestra, it was originally placed before intermission before being swapped with the Dvořák. This ended the evening with many of the musicians having just been prominently featured—a shrewd programming change, given that most of the packed audience seemed to be supporting personal friends and colleagues in the orchestra. The first movement of the Bartók includes a number of musical episodes that emerge from the the composer’s sonic clouds. The solo and duo passages for flute were especially well done, as was one played by Mason Morton on the harp. The massed brass worked up an impressive sound for their featured moment in the second movement; Natalie Shelton’s crisp drumming was another notable strength. The following Elegy was more of Cynthia Woods’s time in the sun, with the conductor teasing out the disparate themes in elegant contours. Oboist Deanna Dawson grabbed a spotlight moment in the fourth movement, and then it was a rapid finale push to the end. One small clarification: although Bartok’s Concerto for Orchestra was premiered by the Boston Symphony under Serge Koussevitzky, it was commissioned by Koussevitzky himself (via his own foundation) in memory of his wife, not by the BSO.